About 30 pro-democracy activists were injured in clashes with the police today as anti-monarch protests spread to other districts of Nepal, a day after opposition alliance rejected the King’s offer inviting them to form a government. 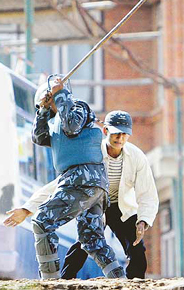 A Nepalese policeman beats a pro-democracy activist with a stick at Balaju in Kathmandu on Sunday. Should the minimum support price of wheat have been hiked by more than Rs 50? Germany today lowered its reservation on the issue of supply of civilian nuclear technology to India saying that developments on this issue were on “the positive path”. NRI steel tycoon Lakshmi Mittal was today declared the wealthiest person in Britain and the seventh richest in the world while as many as 30 NRIs in the UK, including Lord Swraj Paul, had fortunes worth over $ 60 million each. The pressure to extend bonus to farmers who sold their wheat to private parties has started gaining momentum as the Rajya Sabha member, Dr Manohar Singh Gill, and the Federation of Aarhtiya (commission agents) Association of Punjab, decided to take up cudgels on their behalf. Fresh mortar attacks and the discovery of six bodies in Baghdad on Sunday highlighted the security challenge still facing Iraqi leaders after they broke months of political deadlock to appoint a new Prime Minister. The Haryana Government is waiting for the Delhi Government to finalise the Delhi Metro’s alignment to Gurgaon so that it can expedite its project of linking its commercial capital with Delhi with a metro line. Pakistan ended its four-decade-old freeze on screening Indian films by premiering the all-colour version of Bollywood’s magnum opus ‘Mughal-e-Azam’ in Lahore today. 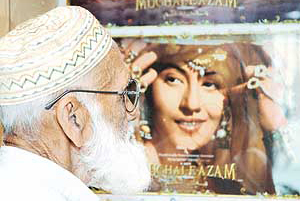 A Pakistani looks at a poster of Indian classic movie ‘Mughal-e-Azam’ at Gulisatan Cinema in Lahore on Sunday.